Right Fielder Austin Todd (44) clubbed his first home run of the season in the Texas baseball team's 8-6 victory Saturday over Baylor in Waco (photo courtesy of texassports.com). WACO, Texas — The No. 12 Texas baseball team jumped out to a convincing 6-0 lead in just the second inning Sunday afternoon at Baylor, but the game got cancelled because of inclement weather. As a result, the Longhorns and Bears split what became a two-game series. Texas (21-13 overall, 4-4 against Big 12 opponents) dropped Friday’s season opener, 6-5, before rebounding Saturday with an 8-6 win over the Bears (22-8 overall, 6-2 in Big 12 games. 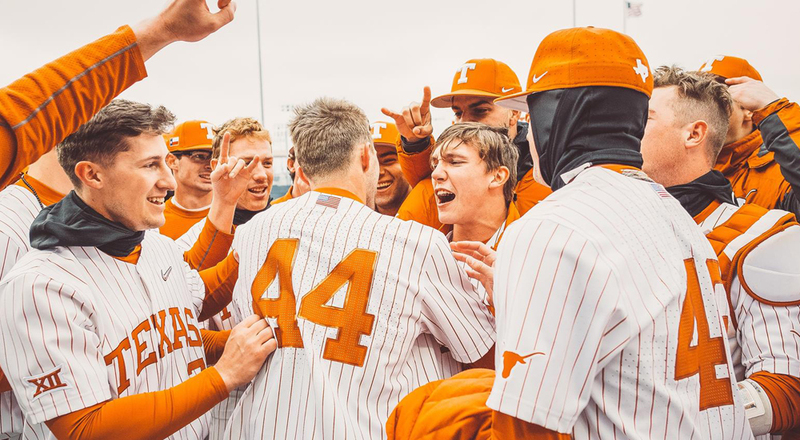 The Longhorns opened the series with a strong offensive start, jumping out to a 4-0 lead, when shortstop Masen Hibbeler clubbed a two-run home run, scoring left fielder Tate Shaw. Second baseman Lance Ford then scored when catcher Michael McCann reached base on a Baylor throwing error, and the UT lead swelled to 4-0 when designated hitter Eric Kennedy doubled to right field, scoring McCann. But the Bears did not go quietly, matching the Longhorns’ four runs with four of their own in the bottom of the third off Texas starter Bryce Elder, who scattered eight hits and allowed five earned runs in 6-1/3 innings. Baylor pulled ahead, 5-4, in the fifth inning when right fielder Davion Downey smacked an RBI single to right, driving in designated hitter Andy Thomas, but Texas got the tying run in the seventh inning when right fielder Austin Todd reached on a fielder’s choice, scoring center fielder Duke Ellis. The Bears scored the winning run in the ninth inning. Matt Whelan, the fourth of five UT pitches to take the mound Friday, was saddled with his first loss of the season as his record dipped to 2-1. Saturday’s rematch was a mirror image of Friday’s game, as the Bears jumped out to an early lead, scoring three runs in the first inning and two more in the fifth to take a 5-0 lead before the Longhorns roared back. Todd got the Longhorns on the scoreboard when he drilled his first home run of the season in the sixth inning, scoring Ellis ahead of him to cut the deficit to 5-2. Ford then singled to left, scoring Shaw and Hibbeler to close the gap to 5-4. In the seventh inning, Shaw singled to right field, scoring third baseman Ryan Reynolds and Kennedy to give the Longhorns their first lead of the game, at 6-5. Ford then picked up another RBI when Baylor pitcher Daniel Caruso hit him with the bases loaded, driving in Hibbeler with what proved to be the game-winning run. Starter Blair Henley threw seven sometimes-wobbly innings, allowing 10 hits and the five earned runs, but then settled down and picked up the win, improving his record to 5-1. Cameron Fields pitched the ninth inning to collect his third save of the season. The Longhorns host the Rice Owls at 6:30 Tuesday at UFCU Disch-Falk Field in a game that can be seen on the Longhorn Network.